This project involved the construction of a railway overhead and embankments to carry the proposed Donald Cousens Parkway traffic to the Markham Bypass project over the existing Canadian National Railway in the Town of Markham, Ontario. The proposed three-span bridge will be orientated in a north-south direction and the approach embankments to the north and south of the bridge are about 9.1m high and taper down away from the structure. The geotechnical investigation revealed that the project site was underlain by very soft soils at depth requiring ground improvement or a large amount of time to allow these soils to settle naturally under the weight of the embankment. The objectives of the treatment were to install more than 1,300 Vertical Wick Drains (VWD) to an average depth of 10m, on a grid predetermined by the geotechnical consultant. The VWD consist of a specially designed synthetic fabric surrounding a corrugated plastic strip that unrolls from a spool. 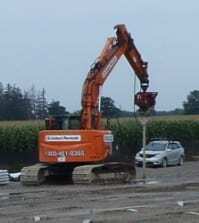 A specially designed hydraulically driven system forces a hollow mandrel into the ground, carrying with it the VWD. After anchoring the drain at the required depth the mandrel releases the VWD and returns to the surface, leaving the VWD behind. The inclusion of the VWD system into the construction of the roadway embankments effectively accelerates the consolidation of the underlying cohesive compressible soils by providing pathways for the drainage of the groundwater in the clayey soils. Following installation of the VWD’s, a 6” drainage tile was laid loosely over the VWD locations and a layer of sand was placed over top. The groundwater is squeezed under the weight of the embankment into this sand layer and any others that naturally exist underground and allows dissipation of the water, allowing the soil to consolidate faster. In the case of this project, some of the surficial soils were too dense to penetrate with the hydraulic system alone. 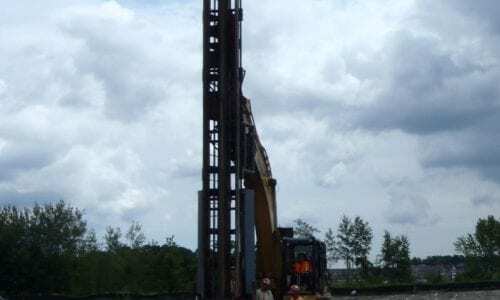 The solution was to pre-drill a hole three meters in depth before starting the VWD and place the mandrel in the hole at the start of soil penetration. The installation of vertical wick drains was completed on schedule, with all installation criteria met. 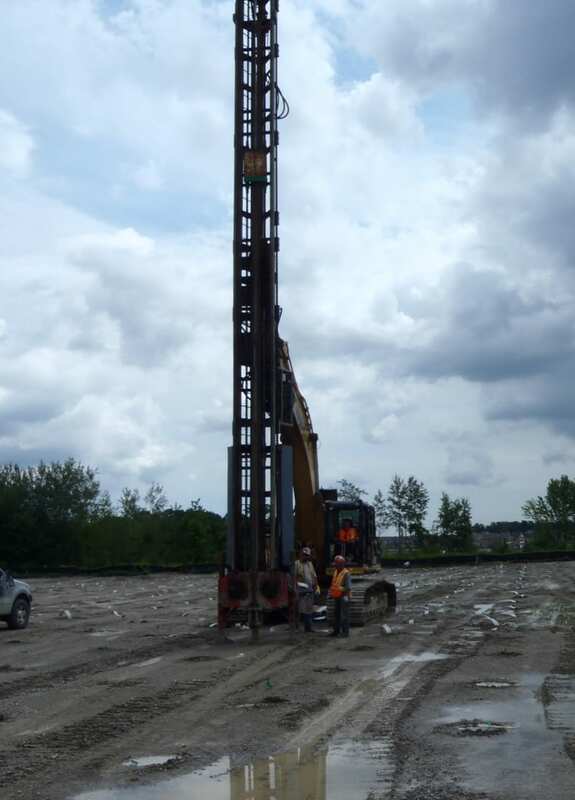 Menard Canada successfully delivered a value-engineering solution of soil improvement providing a time and cost-effective, reliable method, appropriate for the project and site conditions.